New Porsche CEO Matthias Mueller must find synergies with Porsche parent VW without hurting the sports car maker's brand. ROTTACH-EGERN, Germany -- The appointment of VW executive Matthias Mueller as Porsche's CEO is a sign that the sports car maker definitely has come under the umbrella of Volkswagen Group. To make way for Mueller, Michael Macht will move from CEO at Porsche to production chief at VW on Oct. 1. But VW CEO Martin Winterkorn is seeking to dispel the impression that Porsche will be run from outside. His promise is that "Porsche will stay Porsche." The new Porsche CEO has a daunting job: On one hand, he is supposed to find synergies. On the other, he cannot damage the brand. A new Porsche model line, probably in the form of a small SUV based on the Audi Q5, is "very likely," Winterkorn said. A fairly small sports car is at least possible. Porsche's Weissach development center, which Winterkorn describes as a "jewel," continues to be responsible for the 911. Winterkorn has left one issue up in the air: Who will be responsible for a new midengine sports car, Porsche or Audi? But it's certain there will be a "modular sports car parts bin." Winterkorn makes it clear what Mueller's job is as Porsche CEO: Create synergies and strengthen the cooperation with VW. But Mueller will proceed carefully, the VW CEO said. Meanwhile, VW Group is getting a new quality chief from Porsche. 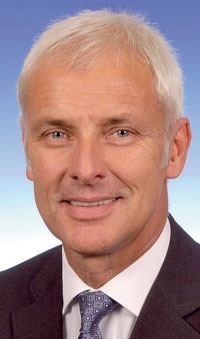 Frank Tuch, currently in charge of quality assurance at Porsche, will take over the role for the entire group Aug. 1. Tuch had been considering a move to Lotus. Winterkorn was impressed with the way Tuch had managed to push the Porsche brand "past Lexus" into first place in the 2010 J.D. Power and Associates Initial Quality Study rankings in the United States. VW regularly scores average to poorly in the study. Winterkorn said: "We have to become better at this."